Welcome to The Apartment Woodworker (.com)! After much delay, I have finally finished organizing my new apartment workshop. Today, I present my new “dining” table, which forms the [literal] basis of the workshop. Hand-crafted (by me) of solid ash (purchased rough-sawn from Exclusively Vermont in Bristol, VT), the table measures 50″ long, 34″ deep and 31″ high and has a 48″ long and 24″ deep lower shelf. The entire piece is finished in two coats of Watco Danish Oil (Medium Walnut). Each leg is a single piece of solid ash nearly 3″ square. 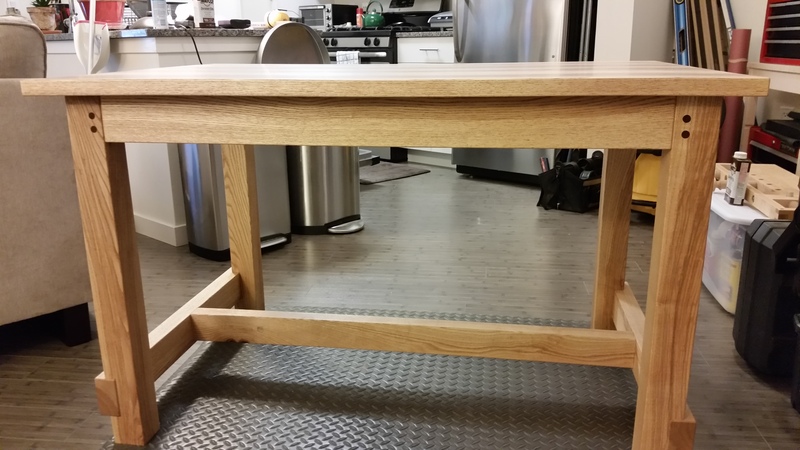 The top rails (3.5″ x 1.75″ of solid ash) are joined to the legs with draw-bored mortise and tenon joints. The bottom rails (also 3.5″ x 1.75″ solid ash) are joined to the legs with 1″ deep housing joints and the bottom stretcher (3.25″ x 1.5″ solid red oak, purchased rough-sawn from Gagnon Lumber in Pittsford, VT) is mortise and tenoned to the lower rails. The tabletop consists of four 1.125″ solid ash boards, edge jointed with a slight round-over at the seams. 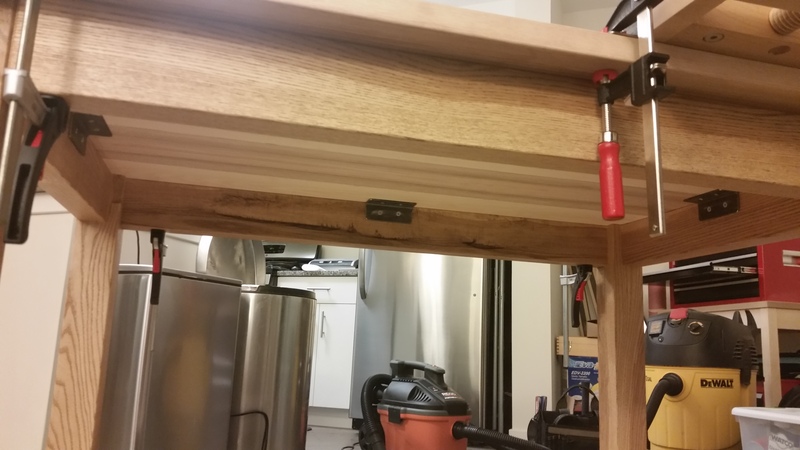 After much debate, I decided to glue the tabletop to the frame and reinforce the glue joint with four angle irons (custom made at Mac Steel in Rutland, VT) secured with 1″ #10 wood screws. The goal was rigidity and, although not elegant, it did the trick. There will also eventually be a lower shelf of solid ash, as soon as I can get back up to Vermont and retrieve the remaining ash lumber. For now, though, a sheet of .75″ birch plywood works just fine. I am also waiting for delivery of the carpet which will live under the table permanently. All-in-all, I am very pleased with the result. Even though the table is clearly intended as a clamping surface for a milkman’s workbench (which will be covered in the next post), the table is very much furniture quality and one day will take its rightful place as a dining table that will far outlast me. On its own (even without the bottom shelf), the table weighs over 100 lbs and, with the plywood bottom shelf fully-loaded, the table is nearly impossible to move. I doubt I will need to worry about bench-wobble causing handplane chatter. Thanks for coming by! Please let me know what you think and stay tuned for my next post, which will cover my condensed tool chest and other workshop accoutrements. 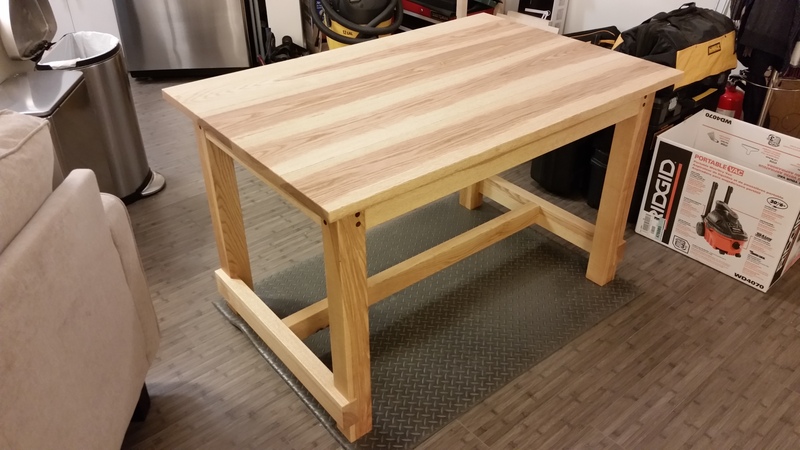 ← Welcome to The Apartment Woodworker!